Discussion in 'A Song For You: The Carpenters Forum' started by Harry, Aug 24, 2015. The Complete Singles collects 66 songs on three discs, from 1969’s “Ticket to Ride” through 1989’s cassette-single release of Karen’s solo “If I Had You.” “Ticket to Ride” and “Your Wonderful Parade” are heard in their original mono single mixes, while the remaining 64 tracks are presented in their original stereo single mixes. I’m thrilled to announce that I have written the new liner notes for the 16-page booklet included with The Complete Singles. The set has been beautifully designed by Bill Pitzonka and includes rare and previously unpublished photos of the duo. Every shimmering track on this first-of-its-kind anthology has been freshly remastered at Universal Mastering with Jim Pierson and Richard Carpenter himself having assembled and supervised the release. 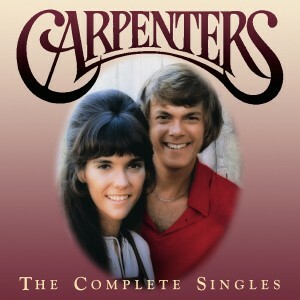 The Complete Singles is being released as a Public Television exclusive in conjunction with the upcoming broadcasts of Close to You: Remembering the Carpenters as part of the acclaimed seriesMy Music. The Complete Singles will not be for sale in stores or through online retail outlets and can only be purchased by making a contribution to Public Television stations when they begin airing Close to You: Remembering The Carpenters this December. However, KQED-TV in San Francisco will be airing an advance, sneak-peek broadcast of Close to You on Thursday, August 27 at 8:00 pm and is already offering The Complete Singles on their website which allows fans nationwide to make a contribution to KQED and receive The Complete Singles CD set by October, two months prior to the nationwide release on Public Television. Joeyesterday, newvillefan and song4u like this. Very nice collection for fans! An exciting development for sure! I was all set to order from the link provided; however, one can not get just the new CD. Since I already have Christmas Portrait AND the DVD documentary, I might just wait until it becomes more widely available? Head scratcher for sure. PBS is infamous for the way it bundles stuff to get you to "donate" more. I'll use the Christmas Portrait as a gift or donation to charity. This collection is assuredly attractive. Yet I am always hesitant to buy repackaged compilations when I already have all the songs in some format already. I hope that the CD set eventually turns up on Amazon, for the sake of us non-USA people. No way am I paying $120 USD (= $159 Canadian dollars), assuming they'd even ship it here. I realize that it's priced high because it includes a donation to PBS, but I wouldn't even benefit from the tax receipt. "...he's making fun of me and laughing at my dreams..."
I purchased (2) full orders so I'm happy to post the contents of one of them once received. The "all done" simply implies no new material. Repackaging of existing is a whole different deal as everything included in THIS set has already been featured elsewhere. This is pretty exciting and caught me off guard, had no idea Richard had finally worked on a U.S. Singles box set. I guess he was under no obligation to announce it as this is a PBS production exclusively. Darn, I don't really have the cash for this but since it's not being sold in stores I'm going to have to order this. Has anyone compared this to the Japan single box as far as track title comparison? The Japan single box was also 66 tracks, Harry I can't remember but did Japan issue the mono versions of those 2 tracks? Or is this really a first? I also wonder if Your Wonderful Parade is the shortened edit version found on my US 45. In addition are these being sourced from the original 45's like Japan did? Exciting stuff, can't wait to get home tonight and place my order. Japan's "Ticket..." single was stereo on the Single Box. There are a number of b-side differences and timing of US singles vs. Japanese releases, so the order is sometimes a bit different. So then technically everything on this set has not been featured elsewhere, correct? Regarding the music aspect. "The set has been beautifully designed by Bill Pitzonka and includes rare and previously unpublished photos of the duo. Jim Pierson and Richard Carpenter himself having assembled and supervised the release." Don’t Cry for Me Argentina (A&M 8629, 1983). Since when was Don't Cry For Me Argentina released as a US single in 1983? That's a new one on me! It was released as a b-side to Calling Occupants on a Memories series single. 70sFan and Chris May like this. It also indicated that the DVD contains additional bonus footage and performances different from what was included in the previous DVD release. Can't wait to see what that is. A few numbers from the TV specials maybe? I saw that too but is it really additional footage because we don't really know what was on the prior PTV version they're referring to. Yes I have that U.S. Single 45 on memories label. Here is yet another difference between the U.S. Singles and the Japan Single box. I thought the single was released in 1980 too, that's what threw me when I saw it listed as 1983. The way it's listed on the new set makes it appear that it was the A-side, I guess they didn't include Occupants as it's already included earlier. Well, I went ahead and placed an order for the DVD and 4 CD set. I'm a lot poorer now since I started visiting these forums. I hope we get more details on the DVD and CD's....I'm in Richard, if there are at least a few new things we haven't seen before. I wonder why a Memories/Forget Me Nots single has been included amongst all the other mainstream singles releases? Does anyone know if these tracks will be the same as those on the Japanese set i.e. lifted from vinyl sources?